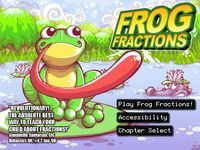 Frog Fractions is a game in which you, Mr. Hop, must protect your fruit from pesky bugs by eating them. But you daren't stop there. The influx of bugs is so great that you eventually have to track it to its source! Also, there are some fractions involved. What Frog Fractions really is is a farcical game that plays with conventions and expectations in the name of humor. It starts out with a simple layout in which you gobble up bugs to protect your fruit, but, through a series of upgrades (among other things) you quickly move into unexpected and surprising territory.